I had the honour to conduct a workshop session for The Body Shop APAC with an audience of 80 social influencers, beauty bloggers and television celebrities on a fine afternoon in May. Pigeon held 2 watercolour workshops with Itchyfingers 3 Sundays ago on 20th March back in sunny Singapore! 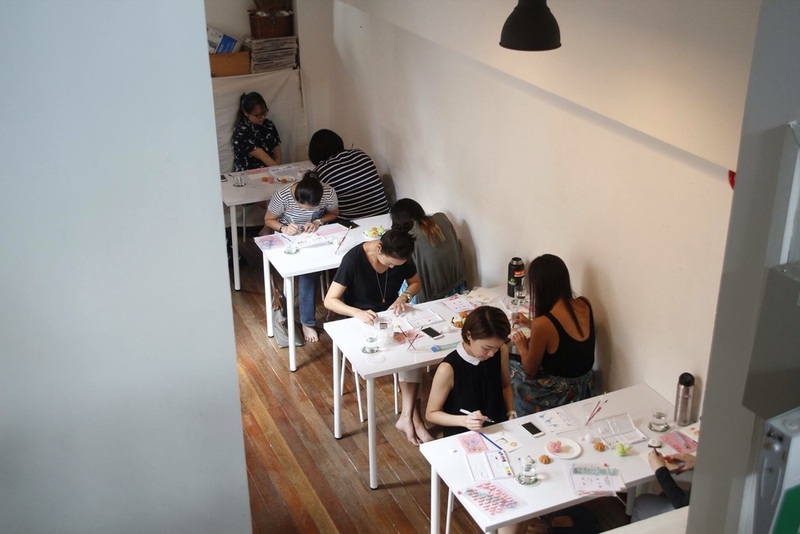 With a full attendance, both classes had so much fun and creativity painting local kuehs that Singaporeans love and grew up with! With almost everyone new to watercolour as a medium, all participants had their hands on painting after a demonstration on basic watercolour techniques, colour, light & shadows. 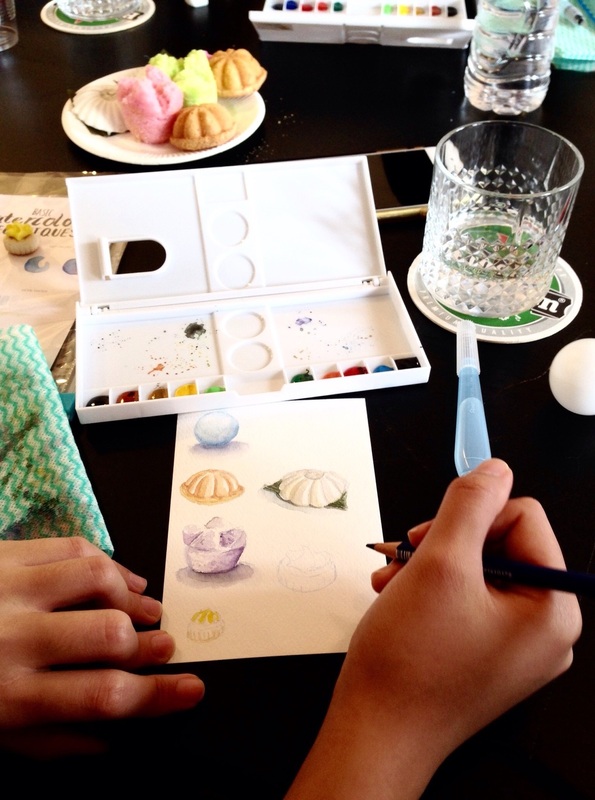 With all materials included, each inspiring and enthusiastic participant had a watercolour palette filled with delicious colours, a brush pen and a little basic watercolour summary card to play with and take home. Many of them were excited as they painted for the first time (or after a long while) with a brush pen. As a big fan of the brush pen for its portability, it was fun introducing them the brush pen as an alternative to traditional brushes. Starting with the signature white pingpong ball as a warm up, everyone moved on to the kuehs and snacks after a short while. I associate painting (I also associate this to being an illustrator) to a walk into deep magical woods, with every new colour and stroke leading to a new surprises. Hence the class was also encouraged to push boundaries by putting new colours, imagination and interpretation to the kuehs that resulted in quite a few surprises! There is no piece of art that can be called ugly. Art is how one perceive, interpret an issue, an object or a story. I had so much fun coaching and spreading painting as a portable hobby to working individuals and I especially would like to give a big shoutout to all who came forward and face their wall of fear in making art! Thank you to all participants who came forward and also Itchyfingers for their cosy studio space! If you have missed this workshop and the previous Christmas Watercolour workshop, stay tuned as Pigeon might make a special trip home this October 2016 for a one-day only workshop in Singapore with the friendly crew at Itchyfingers! Meanwhile, do have a look at the many upcoming workshops that Itchyfingers and their collaborators via their website! **Some photos are credits to the participants and Itchyfingers.sg with no intention of copyright infringement. Since Christmas is just weeks away, we painted cupcakes and gingerbread men, and Christmas stollen and the fruitcake! 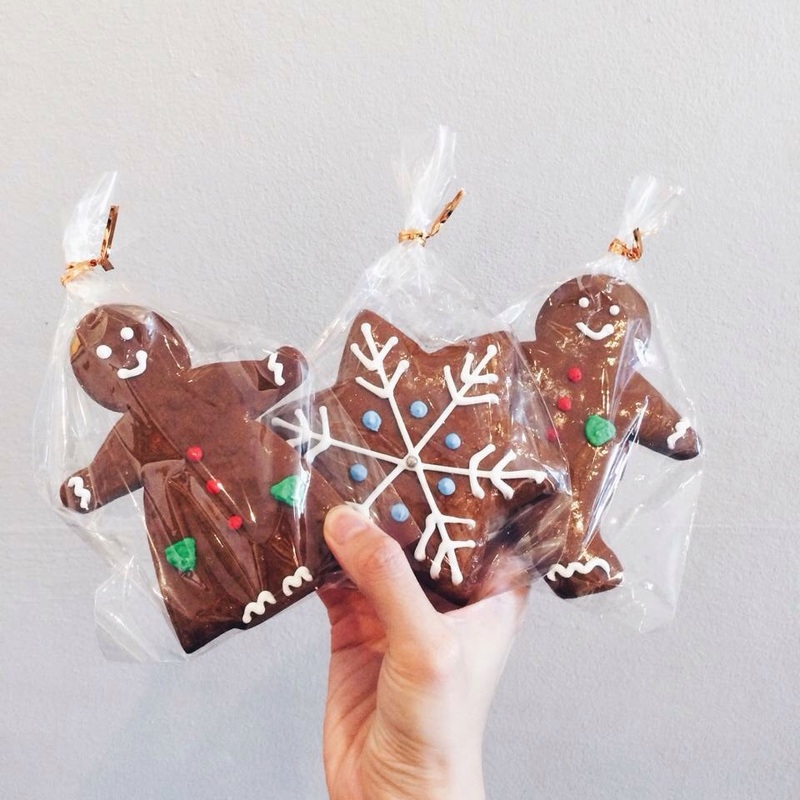 Gingerbread Men from Bakers Well, a local bakery in the heart of Katong, Singapore. 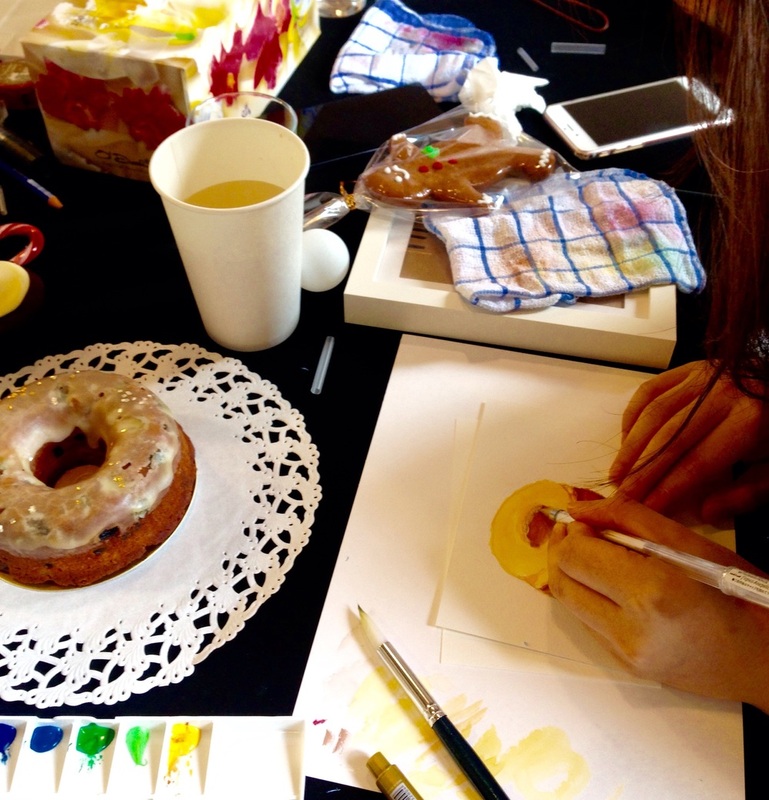 Each participant got to bring home their watercolour palette, brush and everything else on the table like the gingerbread man! Upon giving a short demonstration on basic light and shadows, Colours and controlling the paintbrushes and water, off we go painting from the basics of a pingpong, to the ginger men and cakes! My favourite red velvet cupcakes from Cupcakes with Love at Katong, Clementi and Tampines in Singapore! 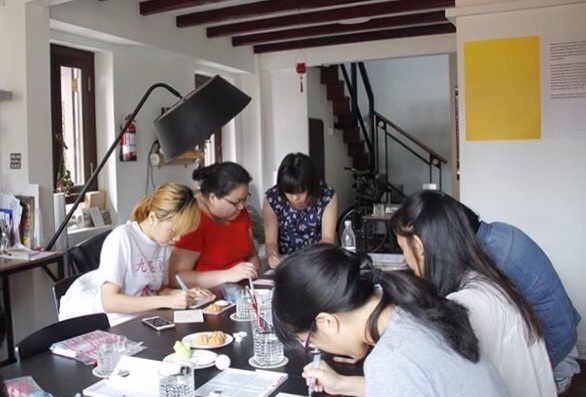 The idea of this workshop is to introduce a new hobby to people who have always felt that drawing and painting is something complex that you will need talent to do it. Most of them came after breaking their wall of fear, afraid that they won't be painting beautifully. But in fact, at least to me, there's no such thing as an ugly painting! I've always thought that there's no such thing as talent in the arts because everyone expresses things in their own way and see things in their own perspective. Same goes for the output of ideas, sounds and images! What really matters is having fun while painting, and putting your sight and sounds on paper! So I'm really glad that everyone enjoyed the session and that everyone couldn't stop painting till the end of the afternoon ! 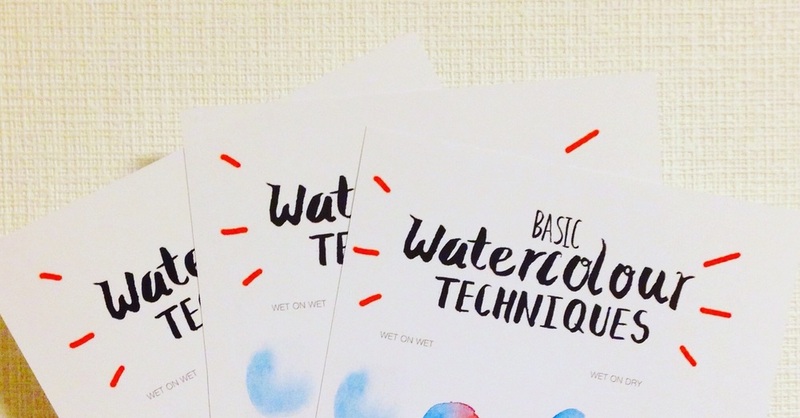 **For casual group / corporate watercolour therapy workshops, feel free to give me a shoutout!